Thanks to technology and a growing number of community-based volunteer monitoring groups, enriched environmental data is being collected on a scale that was inconceivable 15 years ago. An incredible diversity of marine species was recently recorded in the Chain of Bays, about 700 kilometres west of Adelaide, during an inaugural near-shore marine survey of the region by volunteer divers. Integrating the need for major infrastructure development with an ongoing commitment to communities and the environment is the driving force behind a new approach for sustainable development in major projects in Australia. Scientists at CSIRO Materials and Science Engineering's laboratory at Belmont, Victoria, believe that feather keratin can be 'regenerated' into an environmentally sustainable, biodegradable fibre. Banks and super funds have been battered by the gale of the global financial crisis but not everyone is suffering. A voracious national appetite for electronic goods is creating a waste problem we can no longer responsibly ignore. 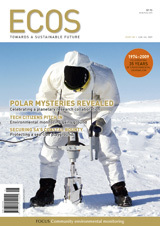 Australian Antarctic scientists joined with polar researchers around the world on 25 February 2009 to officially celebrate two years of intensive, internationally coordinated scientific research for the International Polar Year (IPY). The scientific imperative for action to tackle climate change is now reflected in the emerging responses of leading edge businesses as they find value in innovating to address the challenge. 'Sponge' from starfish biomimetic key to no-carb biofuel? Where to next for regional climate change science?